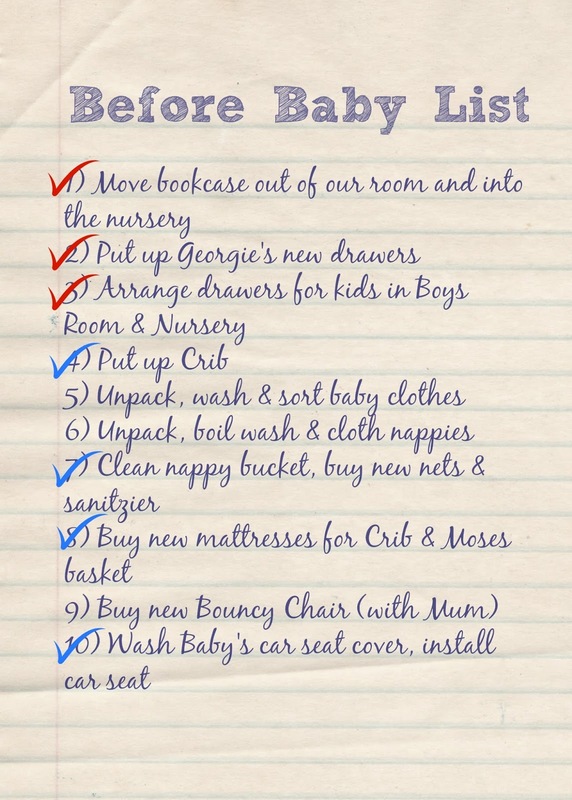 I've been whittling away at the "Before Baby List" that Hubby and I knocked up a few weeks ago. There are only 3 things left on the list now! I am very happy about this! This morning I had a spurt of energy and finally got round to fitting the nicely washed and dried seat covers onto the Baby Car Seat. I've had to rearrange where all the kids will sit in the car though. I had planned for Baby to be in the middle with Tom & Georgie either side and Jack either in the 3rd row or the front seat (depending on if Hubby was with us or not). But I couldn't get the seatbelt to wrap round the back of the Baby Seat which meant that it wouldn't be safe. After 15 mins or so of playing musical chairs I managed to get it all sorted though, and honestly I think this is better and safer the way it's done now! So that's all good! The nappy sanitizer and replacement nets have been here for a while, but I hadn't got round to reclaiming the nappy bucket from the cellar until this morning. I had visions of it being full of dead spiders and other such yuckiness after spending a year down there, but I was very pleasantly surprised! The lockable lid had stayed on and only the outside of the bucket needed a quick clean round. I will run some sanitizer through it before we start to use it but I'm thinking that's a job for the last day or two before I go in for my induction. So now there are only 3 jobs left. One is buying the bouncy seat - and my Mum wants to do that. The other two jobs are the washing and sorting of Baby's clothes and cloth nappies. With still 5 weeks to go I don't see much of a problem with that!